I like to joke that – after coming back from the War in France, they couldn’t keep my grandfather down on the farm, and he moved off to the big city. Actually, Kansas City was the nearest city to the Cass County, Missouri farm where my grandpa was raised, but after serving in World War I, southeast Kansas is where he found work constructing a highway bridge. It was completed shortly after the war, and survived until about 1978, and my mother seems to recall that it was described as a bridge that went from nowhere to no-place. Other than that, there seems to be blank as to exactly where the bridge was located. 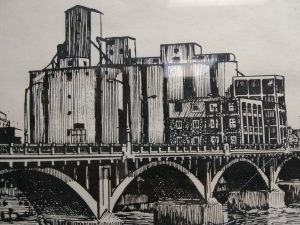 I’m wonder if by posting these pictures of the structure, someone with a long memory might be able to identify the bridge, maybe by using the silos in the background as a landmark. I’m fairly certain the bridge was in the Labette County – Neosho County area of southeastern Kansas. The pen and ink art is another mystery. 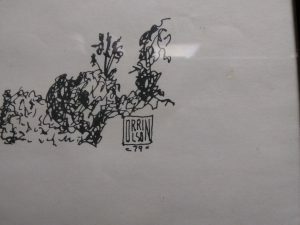 I believe it was acquired at an arts festival and the artist’s signature box in the lower-right corner reads ORRIN, but I can’t make out whether the rest of the writing is part of his name or a dating mark. Since he is the author of the piece, it would be nice to have that information to include with the framed artwork. The piece hanging on the office wall is likely a print, so there could be other copies still out there – perhaps hanging on walls of people better informed than I am. 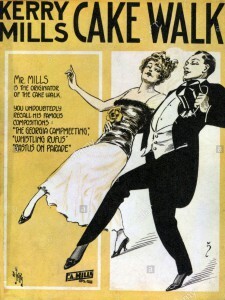 As for the romantic story associated with it… the telephone company used to employ young women as operators – the people who actually connected the person calling with the person being called, through a thing called a switchboard. 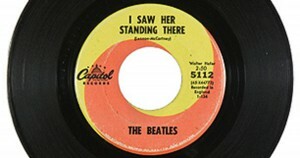 Back then, if you picked up the telephone “receiver” and held it to your ear, a voice would inquire: Number, please! 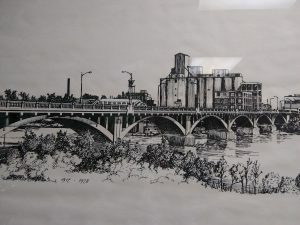 So while the bridge did not survive into the new millennium, descendents of those associated with its construction have – some more curious than others about a bridge to a family’s past. 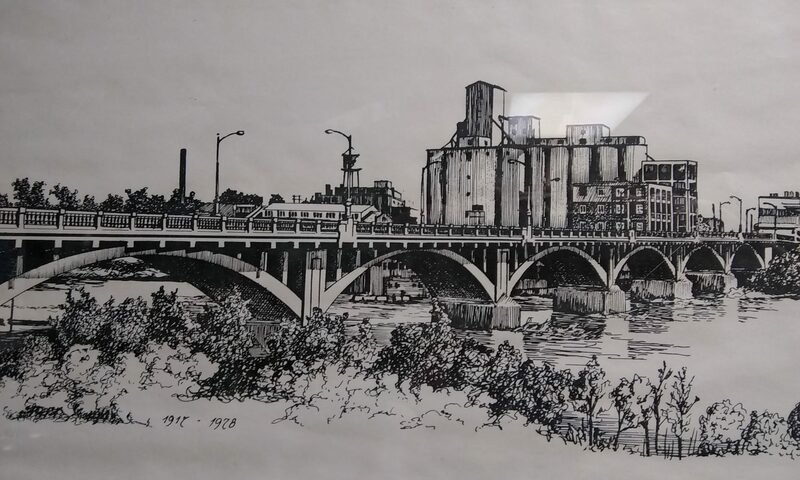 Let me know if you recognize it, or if you don’t, maybe you could share it along in hopes of helping solve this little mystery of the Bridge, the Artist, and the Location – which all figure in the stories of young John and Sylvia and a grandson wanting to pin down the family history! We measure age variously, depending on the who or the what. I drive a twenty-two year old car, but I wouldn’t expect a twenty-two-year-old dog to hop in and hang-tongue from the open window. A twenty-two year old book is just a pup. 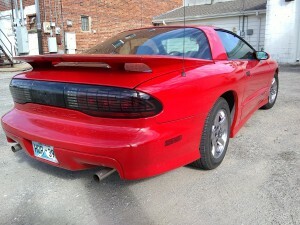 Game of Thrones was published in 1996, for example – the same year my Firebird rolled off the assembly line – and Game of Thrones, the first book in the series by George R. R. Martin, could be considered to be a relatively new story. 170 years ago, and more than a decade before the US Civil War, Bradbury & Evans – a book publishing firm at no. 11 Bouverie Street in London – sent out the first copies of Dealings with the Firm of Dombey and Son: Wholesale, Retail and for Exportation. 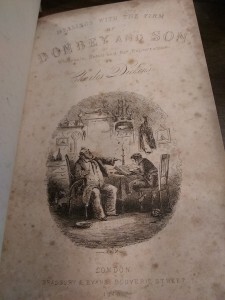 Dombey and Son, as it is known these days, by Charles Dickens. The copy that just arrived in the shop was published in 1848, when the flag had only 30 stars, and the first nugget of gold was found at Sutter’s Mill. To look at it, you’d be hard pressed to believe the book is older than the state of California. That’s the thing, really. An old book is only as valuable as the demand for it creates. The better a book looks and feels – the better chance it might command a premium price. 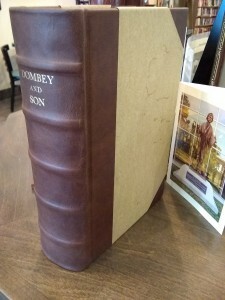 This copy of Dombey and Son, in a fresh leather binding, is a First Edition copy that anyone would be proud to own. Those of us who own older cars understand that it takes some doing to keep them roadworthy, and that it is easy enough to have more invested in an old car than it is worth – practically speaking. It’s a similar situation with this edition of Dombey. Our price on this copy is more than likely less than what the previous owner paid for the solid leather rebinding. The story, of course, is priceless.